The traditional definition of biological evolution usually involves the interactions within and between an organism, their genetic apparatus and the conditions of their environment. In this series of articles the author has extended the concepts and principles of evolution to include the purely inanimate, chemical world that had to have preceded the formation of the first partially-to-completely self-sustaining rudimentary cells (i. e.,protocells). Once such cells began growth through mass increases and a primitive self-propagation of their basic matter and simple structure, this narrative posits how the complex chemistry that operated within them helped them continue changing in further ways to enhance their chances towards more durable structure and wider-ranging functioning should there be future existential stressors and challenges. uniquely and separately displayed. Many new kinds of functions involving membrane- related phenomena could have been tested or explored at this transition stage for their utility or at least survivability under those current conditions. Those that conferred any advantages tended to last longer than those that remained inert, maladaptive or impaired. Ultimately in this “combinatorial protocell self-selection” process, the more optimized combinations began to thrive. Various more successful yet still early protocellular platforms, in astronomically large numbers and variations, now took center stage. Such an early starting point reflects the stage of early protocellular development that must have preceded the more conventional Darwinian and subsequent views on evolution in which one traces back the branches of life through branch-points involved to the Last Universal Common Ancestor (LUCA). My apologies to the reader for using antiquated phraseology in this part of the story. I do not intend to convey any sort of directed or intelligent involvement in a purely physical pre-biological process. Such a process only operated according to the inherent chemical and physical properties of the atoms and molecules as dictated by the physical forces and chemical species and their reactivities that were present. I do not use the terms “Nature” or “Natural Laws” in their original sense that implies something omnipotent had placed or dictated these properties be what they are. My definitions only define that they are as they are found. Nothing more. In my sterile views, atoms, molecules, subatomic particles, fields and all non- vacuum state space simply exist and possess the measurable properties we can observe or measure. This is but one story of their collective habits and proclivities. We now can examine this transition stage even more closely. Simply capturing some rather uninteresting simple and non-biogenically made macro-molecules in aqueous solution within a lipid-like bimolecular-or-multilayered vesicle would not, by itself, be sufficient to provide a path towards a stable, long-term, operational framework. Also keep in mind that we use the term “lipid-like” and “amphiphile” at this early stage because modern day phospholipids, sterols and hopanoids may not have been abundant enough to become the predominant membrane-forming class of molecules. But such a framework could house and support a more rudimentary set of chemistries whose combined output resulted in the continuous self-generation of new protocell mass, including new membrane mass. It would have to be at least complex and productive enough to result in the net syntheses of adequate new membrane components within which to contain the ever-increasing internal water-based chemistry. Within such an ever-expanding volume, this framework housed the generated pools of various intermediates and end products. At earlier stages, the collection was richer in mineral particles, metalloids, and organo-metallics. Though transitional in all likelihood, some may have diversified to other modern forms while retaining their earlier inorganic requirements. Several examples could include barium sulfate crystal production in desmids, strontium sulfate crystal formation in radiolaria and acantharia, silica wall formation of radiolaria and diatoms, and hydroxyapatite formation within osteoblasts. Later, many such early inorganic steps were likely supplanted and replaced with more catalytically specific, more coupling-capable, organic-based species that performed equivalent functions based on differing atomic content. In our carbon and hydrogen rich environment, that would lead to the involvement of abiotically made polypeptides, proteins, carbohydrates, and transmembrane transporting molecules. Early transmembrane transporting molecules (both passive and active) could also have been mineral-based, rather than more complex, purely organic molecules. Such a rudimentary transport capability is an absolutely necessary step needed to provide dynamic machinery to a collection of otherwise thermodynamically-challenged assemblies of molecules. Without such evem inefficient machinery becoming initially available, it would be almost impossible to transit the chasm from an inanimate to an animated state or condition. Assisted membrane transport capabilities are possessed by all present day living cells. Figure 1. Multiple types of protocells originating from different chemical and physical conditions create astronomically high numbers of literal “experiments” within which some combinations may then have become simple, self-growing, and capable of taking in and utilizing high energy chemistries. This latter ability allowed those to indefinitely maintain the rest of the chemical reaction activity while continued energy-rich reactants were present. This linking of a few higher energy chemical reactions involving oxidation-reduction electron transfers and the release and taking up of protons became the main driving force for creating the narrow conditions needed for the internal chemical reactions to operate optimally. Oxidation-reduction chemistry does not require oxygen as the only possible end electron receptor. Any abundant chemical element or oxidizable molecule could have initially provided such a sink for those lost, de-energized electrons. When the catalysts eventually became membrane-bound in their photocells and transferred either the electrons or protons across the semi-permeable membranes, active transport and other directed molecular movements then became possible. At that seminal moment, active transmembrane transport, long-term energy storage and retrieval and energy recharge-ability was born. Osmotically- driven water movements across membranes helped maintain stable protocell sizes and prevention of bursting as the numbers of dissolved solute molecules and ions changed during such energy cycles. A chemi-osmotic energy storage and management capacity was now part of the story leading to a truly permanently self-propagating state. Taken together, these represent a multitude of naturally-occurring trial and error combinatorial experiments in the stability, longevity, durability and survivability of one or more combinations of chemical structures and functions. Such a period of pre-biotic earth, with all of its niches where protocell formation and co- mingling took place, would have been akin to a collection of scenes conjured by Dante Alighieri’s Divine Comedy and portrayed through the art of Hieronymous Bosch. Some niches were fiery hot while others were submerged deep in the new ocean depths or at the edges of shallow surface waters. At some waters’ edges, rapidly cooling volcanic lava blistered with high temperatures, cooking the water-born molecules and protocells that were caught too close. Chemical reactions and high temperature reaction products that only occurred at such higher temperatures would have become common in such niches. The end result of these new chemical actors would only have revealed itself after a further complex process of incubation, with further self-selection taking place. A competition eventually optimizing the abilities and characteristics of these new generations of early proto-life forms that would only flourish in those niche environments. Life from varied protocellular bases would thus arguably have sprung up along many differing initial designs. The subsequent self-selection would have been where the more robust survivors from each genesis center were shaken out of the mix and become the dominant forms. This would have been similar to Darwin’s views on survival of the fittest and natural selection that he theorized occurred much later in the story of life, but on a much more rudimentary level. The internal milieu of such vesiculated self-growing protocells would have been quite varied from one to another. Smaller sized protocell units would have possessed an internal aqueous environment that would have been necessarily smaller in volume. Smaller volumes would have reacted more quickly to changes in internal concentrations of various dissolved species. Larger protocell units would have taken longer for diffusion-limited equilibration and internal concentration changes to affect the reaction rates of various internal chemical reactions as might have been inadvertently cloistered within them during initial packaging or subsequent protocell-to-protocell fusions. These two opposing effects, each with some potential for the protocell’s survivability, would provide at least one basis for ultimately narrowing down the range of absolute sizes that subsequent living systems finally attained. When these early protocells by chance contained catalytically active molecules that could, through various linked sets of chemical reactions, generate and build new ranges of designs of molecules not already produced abiotically, that would have boosted dramatically the possibilities for some of those ancient chemical factories to wind up producing needed molecules that we find in even the simplest of today’s unicellular organism’s structure and operations. Those in particular, having more robust structural stability, necessary but specific chemical reactivity, self-repair capabilities, and structural survivability or persistence, would tend to have preferentially accumulated in total mass and numbers over time. But a continued source of useful chemical energy would have been an absolute minimum requirement for these early entities if they were to become capable of growth. It should be noted that some of the earliest catalytic molecules may not have even been organic in nature. They may, in fact, have been partly or wholly inorganic in their composition, been microscopic-sized solid particles floating within the interior fluid or spanning the protocell’s membrane, or even large solid surfaces in synergistic chemical proximity to an adherent protocell, rather than being in true interior aqueous solution. Many mineral surfaces have known chemically and even stereo-chemically reactive catalytic activity. Microscopic sized crystalline particles of various minerals, collecting within membrane-coated droplets, with the right pH and other dissolved substances would have begun to allow linked chemical reactions to occur within a single volume. Many such reactions that take place geochemically in nature are of the oxidation- reduction (“redox”) variety. Those reactions all involve a transfer of one or more electrons from one chemical species to another. When occurring in an aqueous environment, water molecules are almost always involved and are taken up or given off, along with changes in the free hydrogen ion concentrations. Changes in electric charges on different elements’ valence states are usually also always seen during such reactions. This earliest stage in the formation of the first protocells was likely to also include a concurrent, loosely-coordinated development of both organic and metallo-organic reaction chemistry coupling with redox chemical reactions that provided some of the earliest sources of electromotive force to kinetically drive certain kinds of chemical changes against their natural and spontaneous directions of flow. With redox chemical reactions that find themselves asymmetrically distributed across a protocellular membrane, electrons travel in one direction while protons travel in the opposite direction. Thus whenever these redox reactions became associated with thin, semi-permeable membrane structures that separate two separate aqueous phases, especially if these reactions self-organize across such a membrane with an initial oxidation step occurring on one side and final reduction step on the other, we then have met the basic plan of life’s bioenergetic operation. That basic plan at this early stage was for oxidizing half- reactions to occur on one side of the membrane while reducing half-reactions occurred on the opposite side. The membranes and their embedded “channeling” molecules served the function of a modern “salt bridge” connecting the two sets of half-reactions. And this also can be portrayed as the first electrochemical battery spontaneously being formed. From that point on, as long as the beginning reactants are supplied and physical conditions do not impair things, the system should always continue operating. Figure 2. One of Many Means of Creating the Very First Protocells. Life springing from water droplets? A partly submerged surface rock collects water droplets on it. Some droplets had mixed with a cloud of dust blown up from the land and different types of catalytically-active, crystalline mineral particles were captured within some of the droplets. The rock, previously coated with keragen-type amphiphiles such as found on meteorites or formed on earth, would have thus picked up a hydrophobic coating only a few molecules thick during such contact with the rock’s oily surface. A smaller number of droplets may have collected multiple numbers of two or more types of mineral particles and out of that sub-population, some had the right ingredients to begin removing protons and electrons from the earliest chemical energy sources. They passed them onto the next mineral particle co-mingled with them and so on. At some final step, the last type of mineral particle reacted the penultimate intermediate and the final electron acceptor to release, for example, gaseous hydrogen. And that droplet began to collect hydrogen bubbles within it. 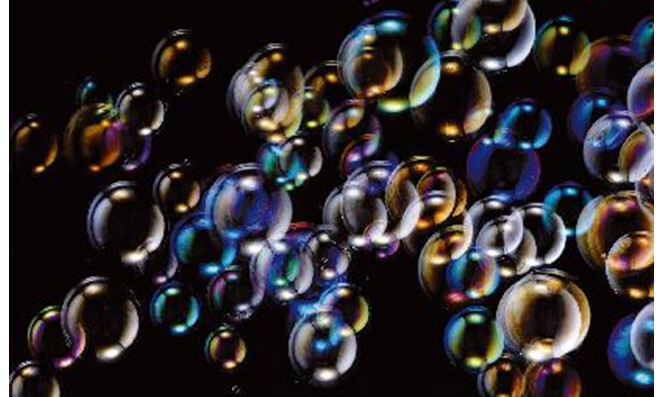 And the bubbling action created separate membrane-bounded aqueous domains of the internal chemistry. Could this have acted as a primitive phenomenon that assisted this early chemical factory to replicate itself? It my not look like much. It certainly did not look like what most would call “life”. But that may very well have been a step very close to the final stage of turning this droplet sized chemical reactor into a self-expanding, self-repairing protocell which now became a new design in the sequence of ever-more complex chemical reactors leading to the first independently “living” cell. And so far these chemical, physical and behavioral features of life’s inanimate chemicals are commonly found today in the natural world. Growth, the ability to increase the total mass and volume of this now self-expanding chemical factory plus the ability to repair or replace damaged or lost structure, would have to be the first important feature needed to be acquired. Such a new capability would take our protocells from a condition of needing a great deal of outside physical and chemical resource processing to internalizing that. That internalization literally lit the fuse that would lead these fore-runners of life towards an ultimately autonomous condition. Each component of this early “cell stuff” had to be synthesized internally for this early indefinitely growing protocell stage to become the next step in the early pre- biotic evolution of life. The creation of new cell-stuff was now moving from the external world into the internal one, and becoming more closely linked to the work capacity contained within the higher energy electrons present in their available fuel-source molecules. As a preview to our actual course of subsequent evolution, we should ask about where the present day metabolic pathway complexity sprang from. In this theorized setting, uncountable numbers of protocell-like structures contained complex combinatorial chemical libraries. These consisted of broad-ranging collections of varied molecules, both in terms of structure and reactivity. Such complexity that resulted could in some cases have lasted relatively unchanged for long geological periods in some more static environments. There, structures that contained macro-molecular assemblies that had reaction sequence-catalyzing capabilities within them, became the predecessors for future super-complex branched and internally self-regulating branches of our current metabolic pathway enzyme sequences. Macro-molecular species could have finally found the environmental incubators within which to grow in places like the interstitial water residing in highly mineralized soils in contact with surface and subsurface water sources. These future metabolic pathway actors, often being amino acid-based poly-peptides formed through dehydration reactions possessed significantly different molecular structures and were capable of providing specificity to the underlying reaction chemistry. That specificity was asserted through molecular geometries such macro-molecular chains could provide. Many variants of these molecular “cherry-pickers” must have become available in this pre-biotic world and its countless niches. But out of each variant capable of carrying out the same catalytic functions that then existed, only the most catalytically productive ones would have survived in the widely diverse branches of the tree of life of today. This may be another reason we often have the same function built into two quite different proteins that are structurally dissimilar when comparing members from different branches of taxonomic relevance. Simple fusion of all possible combinations of such varying content protocells then could at times have created new levels of complexity in which multiple end-products of simple pathway operation would have been generated in proximity with one another. Picture this: One kind of protocell containing a short sequence of glycolysis-related enzymes, fusing with another protocell containing a different metabolic pathway’s main catalytic capabilities. Whether the fusion resulted in a single, co-mingled collection of those enzymes and catalysts or whether such fusion resulted in an internalized and compartmented final structure would subsequently lead to different ultimate behavior and capabilities of future generations derived from each. Overall though, this merged the outputs of one pathway to the inputs of others, all in a very tiny volume. Such concentration of multiple new metabolic end-products within single protocells now allowed larger scale leaps in the evolution of complex cell structure, design, operation and functioning. Thus the rate at which evolution of inanimate matter finally attaining a truly self-sustaining state greatly accelerated from some critical points within this pre- biotic epoch of growing complexity. Figure 3. The Overall Process of Pre-Biotic Evolution Aided by Aerosol Formation. This is but one of many descriptions of such protocell generation. (a) Seas, lakes, ponds, pools and rivers created aerosols. 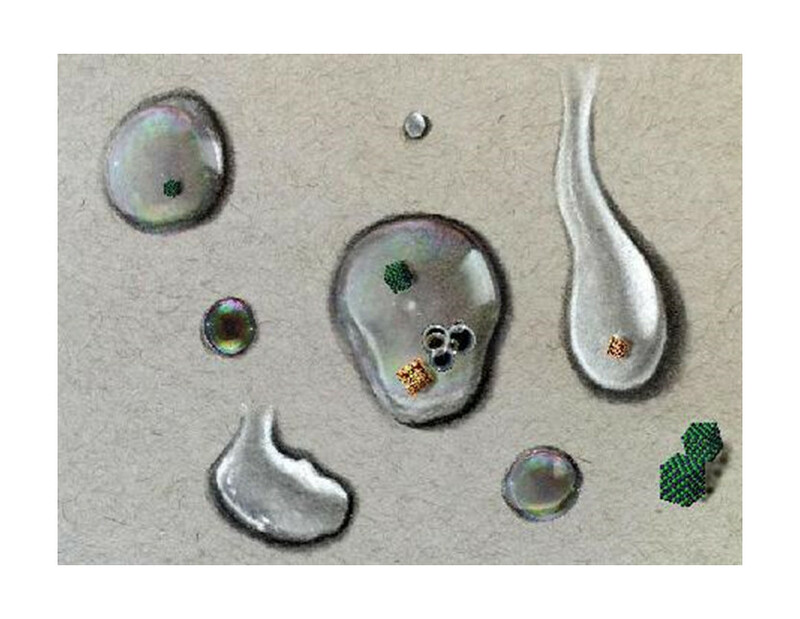 Tiny droplets of water containing many different combinations of constituents, some of which have several types of linked chemical catalysts that cause coordinated chemical reactions that take simple molecules from the environment and add to and modify their structures into more useful forms. (b) Hydrocarbon-rich waters coated with multi-colored sheens of multi-layered, amphiphilic molecules collected everywhere. 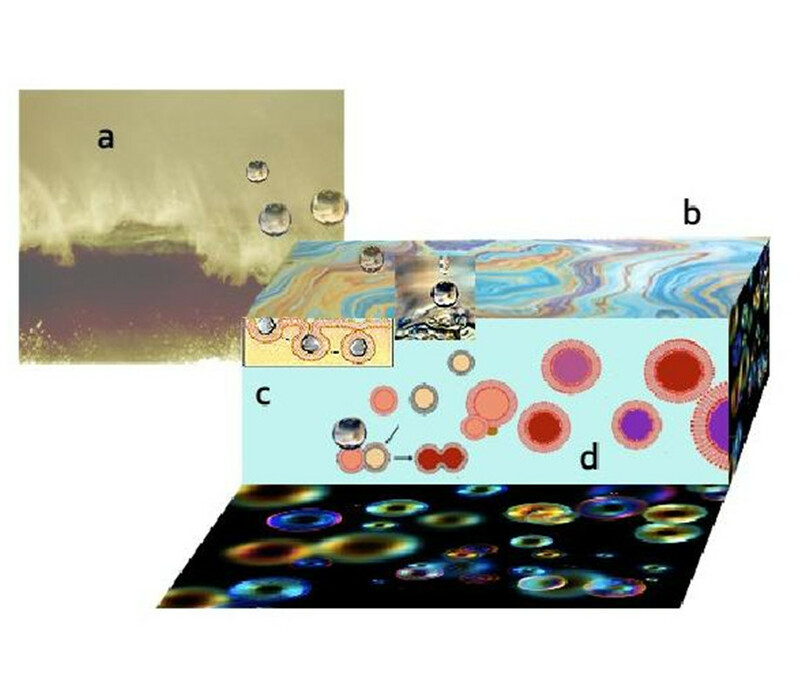 This natural and spontaneous separation of oil-from-water behavior with subsequent surface spreading presented huge areas of membrane-precursors awaiting the landing of small droplets of aerosols (c) from different sources. One alternative to aerosolization, as diagrammed in Figure 2, allowed protocell vesicle packaging through lipid-coated water droplets collecting and streaming down surfaces before slipping beneath the surface of larger bodies of water. (d) sometime well after vesiculation packaging of coupled catalytically-related mineral particles, macromolecules and similar active sites, feedback modulations would have had to become part of the most optimized modifications. Such a feedback design would impose a regulated, variable-control, processing speed that would have allowed switching on and off or partial down-regulation of the overall activity of such pathways. With those controls, better inter-pathway integration and intermediary pools of reactants and products provided even more refinements in the control and management schemes that such protocells would enjoy. The presence of such linked catalytic elements with feedback control would have created a processing cycle during its operation. From an exterior view, that would have behaved in a steady-state input-output flow design that could elicit oscillatory behavior at critical parametric values. It was capable of both classical as well as chaotic kinetics. That is represented in our diagram above by the final oscillating alteration of the colored protocells at the right. As long as new initial substrates remain available, able to be transported in and input into the beginning of such linked pathways, the final end-products of chemical synthesis would be generated. And if those end-products were simply new “cell stuff”, these protocells would simply continue to grow in size without the necessity for any further subdivision of the enclosed cell mass. Obviously physical forces that occasionally impacted upon such a growing protocell could stretch and force that very gel-sol-like entity to pinch off or be subdivided into smaller sized packages in an unprogrammed manner. These would be mostly conserved through the lipid membrane’s innate property for self-sealing during any hyper-distortion or over-stretching. And as the relatively slow scissioning of new protocell production through physical fragmentation occurred, each new resultant “daughter” protocell would itself become the next center of growth as long as there were adequate nutrients available. Such an early, but inefficient reproductive process is arguably a likely early beginning to the overall later mechanism of reproduction which would eventually evolve much more efficient and high fidelity features. Such features would include an information storage and management system (nucleic acids, genetic code, and chromosomes). Such a development will be considered in subsequent chapters of this re-examination of early earth. The Chemiosmotic hypothesis was first proposed by Peter Mitchell to be the operating form of bioenergetics in modern day living cells in 1961.7 It was one of two competing views attempting to explain why, if not how, energy-rich, naturally unstable molecules like adenosine triphosphate (ATP) were created in cells. Those views eventually merged to form the current biophysical energy management model of the cell. It was well appreciated that without a continuing utilization of, and replacement of ATP, all cells eventually died. And since most ATP was cyclically reformed in a majority of aerobic cells from glucose with the utilization of oxygen creating a major enhancement of this production, the mitochondria of eukaryotic cells, along with many kinds of Bacteria and even Archaea were probed for evidence of this. Such was the case and this was even extended to the process of photosynthesis and ultimately the fixation of carbon dioxide. So what form of energy was tapped into to become the main “glue” for the attachment of the phosphate ion to the adenosine diphosphate precursor? It was ultimately demonstrated that intact semi-permeable vesicles with membrane-based catalysts and internalized electron carrier chemical species were at play in these operations. But the main initial form of energy that drove all this subsequent chemical synthesis, as described above and in the last installment of this series,4 was the production, maintenance and utilization of an electrochemical, or more accurately, a proton-motive gradient across those active membranes. The building up of proton gradients across a topologically enclosed, self-contained membrane vesicle resulted in the ability to store useful energy in the form of electrostatic charge separation plus concentration gradient/entropy-driven work whenever the opening of channels through that membrane provided a mechanism of tapping that stored energy for later usage. When the proton gradient generation and utilization were accomplished through the same set of transmembrane molecules, the birth of a longer lasting capacity to live through intervals of energy starvation was born. The protocells with such a built-inrecharge-ability could now actually live long and prosper! What was not so apparent in the early halcyon days of bioenergetics research was that this process might also be equally applicable to all other eukaryotic cell membrane-based systems and organelles as well to mitochondria, chloroplasts and bacteria. The current view of the author is that in a modern day eukaryotic cell, each membrane- bounded compartment within the cell, from the intact interphase nucleus, to the mitochondria, lysosomes, peroxisomes, endoplasmic reticulum, Golgi complex, pinocytotic and exocytotic vesicles, contractile vacuoles, to other kinds of membrane- bounded storage vesicles, all of these subcellular membrane-bounded compartments exist and allow the creation and maintenance of disparate and incompatible chemistries to reside in close proximity. This proximity also allows their respective chemstries to be coupled, when appropriate, to one another. But existing between all of them is a complex synergy and set of symbiotic interrelationships that allow each to “supply” and “feed” off of its co-inhabitants, providing a modern day niche within which a “eukaryotic meta- evolution” continues to take place. Regulated and controlled transmembrane movements of protons, sodium, potassium, calcium, magnesium and other ions as well as specific uncharged molecules across such semi-permeable barriers creates a much more highly choreographed control and interlinked framework. This also provides the connections to the primary energy storage of the cell for many other transmembrane transport of other molecules, both actively and passively. This higher-level, interlinked organization to accommodate multiple pathways, each of which produces different end-products, taken together, allowed life to utilize those various coordinated synthetic products towards building new mass as required for its newer, more complex architecture. And that allowed it to address and overcome even more challenges to its survivability when encountering new environments. This allowed the eventual multi-compartmented versions of protocells to become more elaborated into uncountable types of multi-compartmented, metabolically segregated versions of proto-eukaryotelike patterns in meeting ever more challenges to their development. This idea is partially explored by Gabaldon and Pittis.11 The present day eukaryotic cell design would have thus originated through the independent and/or concurrent or repeated incorporation of various preexisting protocells into the growing multi-compartmented forms, with each adding its individual and unique capabilities to the mix. Such heightened elaboration would aid in ultimately attaining the additional higher levels of structural organization, new function development, and thus, survivability. This latter aspect is what evolution in all its variations is really all about. It would be the final step just before trophic behavior (dynamic goal-seeking) and genetically-driven reproduction could become established as a endpoint universal pattern for terrestrial life. This was the step immediately before independent protocell motility could become possible. It was here that the ultimate coupling of the internal operating chemistry linked up with the external environmental’s chemical offerings and physical state. Dissolved ionic substances in bulk aqueous phase always have a series of coordinated shells of water molecules surrounding them, loosely attached through polar interactions and hydrogen bonding. This spreads their net charge out over a larger surface and thus their electric charge is less concentrated. Such an arrangement forms a compatible means of maintaining the solvated state. More water-soluble substances have more of this coordinated water around them than less water-soluble substances. But when those ions begin to interact with other kinds of molecules, such as proteins, some or all of those water molecules that immediately surround them are stripped off, replaced by various chemical and polar groups that are part of that larger molecule. Differences in polarizability and electronegativity of the replacing atoms creates stronger bond formations through decreased energy of solvation. Such a reversible “dehydration” step of the ion’s shell of water molecules transiently occurs as an ion passes through ion transport channels in semipermeable membranes. Once through the membrane, new water molecules assembly around the ion to resolvate it into the aqueous phase on the opposite side of the membrane. Chemiosmotic behavior is initially created through the net movement of ions through open channels that span across a semipermeable membrane. Following the movements of those substances, water molecules must also move across the membrane to reestablish equal osmotic pressure across the membrane. Those water molecules are thought to mainly flow through and between the phospholipid molecules and their fatty acid tails where smaller sized “pockets” of space can exist due to the presence of internal membrane fluidity or liquid crystalline phase change behavior caused by the presence of non-rotating unsaturated double bonds plus rotatable single bonds involved between adjacent carbon atoms in the fatty acid chains. When this movement is passive, down- gradient movement of ions occurs (in the absence of an energy source). The ions are, in fact, spontaneously moving down their electrochemical (and concentration) gradient. This phenomenon requires a non-equal concentration of the substance or ion to begin with and then it will proceed when the transmembrane channels are opened. And as the number of such ionic particles move from the higher concentration side to the lower concentration side, similar to water flowing downstream over a dam, the potential energy originally stored in that water is converted to kinetic energy and then dissipated as frictional heat or transferred to the chemical or physical environment in another form. Humans have engineered the water dam to a greater extent than the original design created by the beaver. They did this by adding water wheels or turbines to convert the linear water flow’s kinetic energy into rotational kinetic energy. Through further connections to millstones, pumps, electrical generators and the like, we reclaim some of that energy in the form of useful work or more usable forms of energy. The early evolution of life created these energy-extracting designs at the molecular level billions of years earlier! And even more impressively, evolved the reciprocal means of regenerating such gradients and permanently maintaining them in a non-equilibrium state to handle all of life’s future energy needs through such an energy storage process. An example of this would be the various membrane-based “ATPase” activities associated with many kinds of biological membranes as well as the overall generation of adenosine triphosphate (ATP) by the up-hill movement of hydrogen ions, from lower to higher concentrations, across a membrane during cellular respiration or photosynthesis. An ion gradient has potential energy contained within it and can be used to power many other chemical reactions. When the ions pass through a molecular channel designed to link their movement to other coordinated molecular movements, electron transfers or changes in partially charged states will result. Hydrogen ions, or protons, will preferentially diffuse from an area of higher proton concentration to an area of lower proton concentration, and an electrochemical concentration gradient of protons across a membrane can thus be harnessed to make ATP. The overall reaction takes the initial two negatively-charged reactants of adenosine diphosphate (ADP) and inorganic phosphate (PO4-3) and brings them together while concurrently removing a hydrogen atom and hydroxyl group, resulting in the formation of a higher-energy content covalent bond. This reversible, overall proton transport process is thus inextricably connected to the water movement through osmosis. That is why the entire phenomenon is called “chemiosmosis”. In virtually all modern day cells, whether prokaryotic or eukaryotic, ATP synthase is the enzyme that makes ATP, energized through chemiosmosis. It allows protons to pass through the membrane and uses the free energy difference to phosphorylate adenosine diphosphate (ADP), making and reforming ATP in a cyclic fashion. In its many forms, ATP synthase involves rotational movements at the molecular level as well during operation. With all of these different basic protocells floating about, merging together, co-mixing their interior contents while co-mixing their varied membrane compositions, mutually swapping chemical species, or alternatively taking smaller protocells with different internalized chemistries deep within them, what was this massive combinatorial world of protocells like? Our next installment looks at some of these more complex events to see how they could have formed the bridges to modern day life forms. 1.Guth, J. H. “Pre-Biotic Evolution: I. From Stellar to Molecular Evolution”. 7.Peter Mitchell (1961). “Coupling of phosphorylation to electron and hydrogen transfer by a chemi-osmotic type of mechanism”. Nature. 191 (4784): 144–148. 8.Pasek, M. A., J. P. Harnmeijer, R. Buick, M. Gull, and Z. Atlas “Evidence for reactive reduced phosphorus species in the early Archean ocean.” Proc. Nat. Acad. Sci. (June 18, 2013) 110 (25): 10089–10094. 9.Pasek, M., B. Herschy, T. P. Kee (2015) “Phosphorus: a case for mineral- organic reactions in prebiotic chemistry.” Orig. Life Evol. Biosph. 45(1-2): 207- 218. ©Copyrighted by Joseph H. Guth, 2017. All rights reserved.